11600 Adie Road St. Louis, MO 63043 314.692.8388 f 314.692.5152 www.edgetechnologies.com call or click: 314.692.8388 www.edgetechnologies.com Our Mission is Your Production T he Rebel 80 is an automatic bar loader for 8mm to 80mm bar capacities. Material can be round, hexagonal or shaped. Touch screen control with 300 part program storage speeds set-ups. Complete setup in 3 minutes with a full automatic adjust for bar diameter. The maximum bar length is up to 60" depending on spindle length. This loader features a magazine capacity of 30 linear inches for lights-out unattended running. The Rebel automatically adjusts pusher force for bar size and has accurate positioning without a mechanical stop. It also features spindle liner storage on rear of the stand, and standard X axial shift device with Z optional. All electric operation, no shop air is required. Big on features, small on price. T he Minuteman 320 is the best value in 3-20mm bar fed applications for Swiss lathes, a brilliant combination of features with an economic price. With a bar capacity of 3-27mm it features: an automatic loading magazine, space-saving double pusher, polyurethane quick change channels with hydrodynamic support via high volume oil flow into channels, and features dual anti-vibration devices. Standard equipment includes: Swiss headstock synchronization device, telescoping front nose, automatic remnant retraction with a self-centering gripper, and a custom lathe cable. The Mitsubishi motion control is dependable and user friendly. The Minuteman is a sure thing for a high quality, affordable, feeding solution. T he Patriot 338 and 551 are two of the most effective and price worthy to claim our Economical Excellence moniker. With a bar capacity of 3-38mm or 5-51mm they both feature space-saving double pushers, polyurethane quick change channels with hydrodynamic bar support via high volume oil flow into channels. The Mitsubishi motion control is dependable, user friendly, and features a 36 part program memory storage for quick changeovers. Standard equipment also includes: Swiss headstock synchronization device, telescoping front nose, dual anti-vibration devices, automatic remnant retraction with a self-centering gripper, and a custom lathe cable. The Patriot is a lot of feeder for a little money. Visit us at www.edgetechnologies.com or call us to get more information on how Edge Technologies, your Productivity Partner, can help your bottom line. T he Scout 320 is a fine example of Edge Bar feeder Economic Excellence. With a bar capacity of 3-27mm, it features: an automatic loading magazine, space-saving double pusher, quick change hydrodynamic guide channels, and dual anti-vibration devices. Also offered as standard equipment: Swiss headstock synchronization device, telescoping front nose, automatic remnant retraction with a self centering gripper, and a custom lathe cable. T he Rebel 80 Servo Unloader is a compact unloading system for CNC lathes for parts in the diameter range of 8-80mm. Parts are gently extracted from the sub-spindle of the lathe. With a large magazine capacity allowing for long unattended operation, the Rebel combines the advantages of auto part unloading with a small footprint and an economical price. Edge Bar Feeders are an outstanding fusion of engineering, quality, and affordable prices. The Edge Army Marches On. 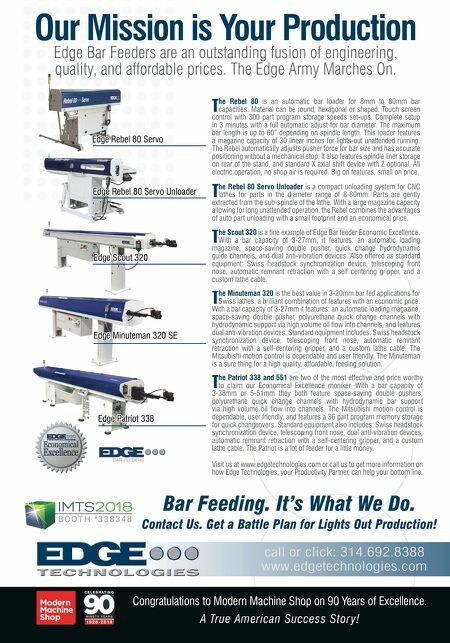 Edge Rebel 80 Servo Unloader Edge Rebel 80 Servo Edge Scout 320 Edge Patriot 338 Edge Minuteman 320 SE Bar Feeding. It's What We Do. Contact Us. Get a Battle Plan for Lights Out Production! 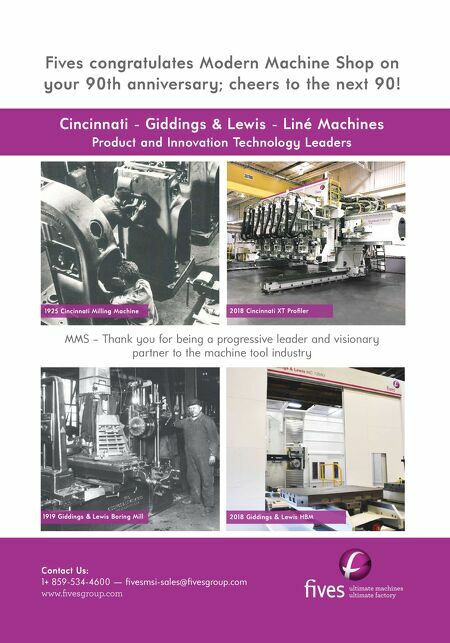 Congratulations to Modern Machine Shop on 90 Years of Excellence. A True American Success Stor y!